The Knee injury and Osteoarthritis Outcome Score (KOOS) was developed as an extension of the WOMAC Osteoarthritis Index with the purpose of evaluating short-term and long-term symptoms and function in subjects with knee injury and osteoarthritis. The KOOS holds five separately scored subscales: Pain, other Symptoms, Function in daily living (ADL), Function in Sport and Recreation (Sport/Rec), and knee-related Quality of Life (QOL). The KOOS has been validated for several orthopaedic interventions such as anterior cruciate ligament reconstruction, meniscectomy and total knee replacement. In addition the instrument has been used to evaluate physical therapy, nutritional supplementation and glucosamine supplementation. The effect size is generally largest for the subscale QOL followed by the subscale Pain. The KOOS is a valid, reliable and responsive self-administered instrument that can be used for short-term and long-term follow-up of several types of knee injury including osteoarthritis. The measure is relatively new and further use of the instrument will add knowledge and suggest areas that need to be further explored and improved. Why assess Health-Related Quality of Life with the Knee Injury and Osteoarthritis Outcome Score (KOOS)? The main reason for developing a single instrument with the purpose of covering several types of knee injury and including osteoarthritis (OA), was that traumatic knee injuries often causes concomitant damage to multiple structures (ligaments, menisci, cartilage, etc.) and frequently lead to the later development of OA. To be able to follow patients after a trauma and to gain insight into the change of symptoms, function etc. over time, a questionnaire which covers both the short-term and long-term consequences is needed. Prior instruments such as the Lysholm knee scoring scale  have focused only on the short-term consequences and instruments such as the WOMAC Osteoarthritis Index  only on the long-term consequences. An instrument intended for follow-up of these patients needs to adequately monitor both the acute injury consequences in the physically active and younger patients, and the chronic outcome in the older. The KOOS is a knee-specific instrument, developed to assess the patients' opinion about their knee and associated problems. 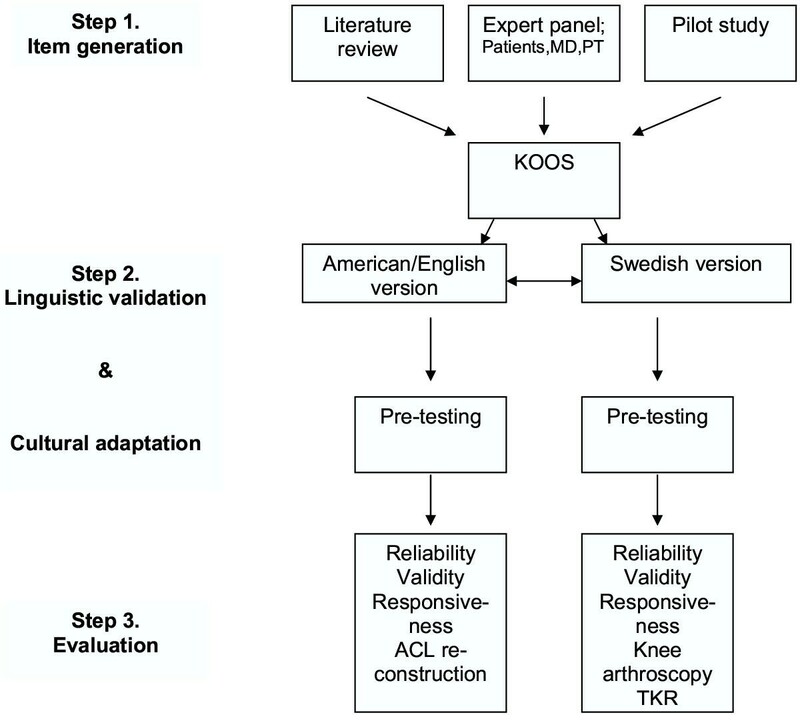 The KOOS evaluates both short-term and long-term consequences of knee injury. It holds 42 items in 5 separately scored subscales; Pain, other Symptoms, Function in daily living (ADL), Function in Sport and Recreation (Sport/Rec), and knee-related Quality of Life (QOL). How was the KOOS developed? The KOOS was originally developed in 1995 by Ewa M Roos and colleagues at the Departments of Orthopaedics at Lund University, Sweden and at the University of Vermont, USA. Thus, the American-English and Swedish versions were developed simultaneously. To ensure content validity for subjects with ACL injury, meniscus injury, and early OA, we reviewed the literature, consulted an expert panel, and conducted a pilot study (Fig. 1). The literature indicated three principal areas of patient-relevant outcomes: symptoms, functional status, and satisfaction. An expert panel comprised of patients referred to physical therapy because of knee injuries, orthopaedic surgeons, and physical therapists from both Sweden and the United States, was asked to identify short- and long-term symptoms and functional disabilities resulting from a meniscus or ACL injury. Seven factors were identified by the panel: pain, early disease-specific symptoms, late disease-specific symptoms (e.g. symptoms of OA), function, quality of life, activity level, and satisfaction. Development and evaluation of the KOOS. A pilot study was then conducted to identify the subjectively most relevant factors among patients with post-traumatic osteoarthritis. Seventy-five individuals who had had meniscus surgery 20 years previously were asked to respond to two questionnaires, both self-administered. The participants ranged in age from 35 to 76 (mean 56), and showed radiological signs of knee OA, defined as joint space narrowing and osteophytes. One of the questionnaires, by Flandry et al. , was constructed to assess symptoms of anterior cruciate ligament (ACL) injury and the other, WOMAC Osteoarthritis Index , for assessing symptoms of knee OA Questions that most frequently received high responses, and were thus considered to reflect the most predominant symptoms, included those relating to pain, swelling, stiffness, and the ability to run, jump, kneel, and squat. To be able to calculate WOMAC scores from the KOOS, the questions from the WOMAC Osteoarthritis Index LK 3.0  were included in their full and original form in the KOOS questionnaire (with permission, Nicholas Bellamy personal communication 1995). The KOOS dimension of Activities of Daily Living is equivalent to that of Function in the WOMAC Osteoarthritis Index. Questions included in the subscales Sport and Recreational Function and knee-related Quality of Life were adopted, in their original form or with some modification, from other outcome measures used to assess ACL injury [3, 4]. Satisfaction and activity level, two dimensions also considered relevant by the panel of experts, were not included in the KOOS, since it was not possible to agree on wording that would be applicable for all situations. How was the KOOS validated? The KOOS has been validated in several different populations having surgical procedures due to knee complaints. To ensure the instrument being valid for both short-term and long-term consequences, validations have been carried out in different populations with varying diseases and durations and at varying ages and activity levels. Firstly, the American-English version was validated in subjects (age range 18–46) undergoing surgical reconstruction of the ACL . Secondly, the Swedish version was validated in subjects (age range 16–79) undergoing knee arthroscopy . Thirdly, the KOOS was compared to the WOMAC in subjects meniscectomized 16 years previously (age range 38–76) with and without OA . Fourthly, a validation study was carried out in subjects (age range 43–86) treated with total knee replacement for OA . For patients on the waiting-list for total knee replacement for OA, content validity was assessed before surgery by asking the patients to rate the importance of improvement in each of the five KOOS subscales on a 5-point Likert-scale as extremely important, very important, moderately important, somewhat important, or not important at all. For each subscale examples of questions within the subscale were given. 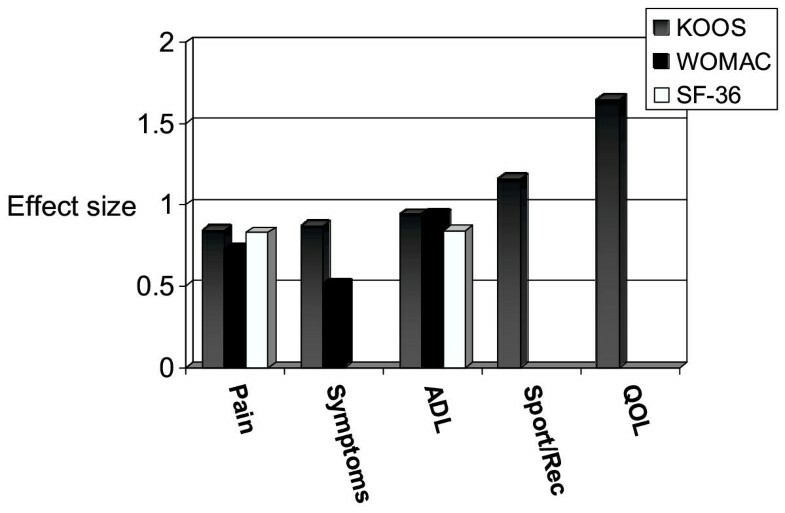 Over 90% reported that improvement in the four subscales Pain, Symptoms, Activities of Daily Living, and knee-related Quality of Life was extremely or very important when deciding to have their knee operated on. 51% reported that improvement in functions included in the subscale Sport and Recreation Function such as squatting, kneeling, jumping, turning/twisting and running was extremely or very important when deciding to have their knee operated on. Postoperatively, patients tended to start doing physical functions they did not do prior to the operation. Convergent and divergent construct validity was determined in comparison to the SF-36 , and when applicable also to the Lysholm knee scoring scale . The KOOS has been formally validated in American-English , Swedish  and German . Translations are also available in Danish, Russian and Italian. Spanish, French, Icelandic, Polish, Estonian and Greek versions are pending. What modifications for other joints and diseases are available? The KOOS has been modified to assess problems associated with the foot and ankle (FAOS)  and with the hip HOOS . A modification intended for evaluation of lower extremity problems (hip, knee and foot) in subjects with rheumatoid arthritis and other inflammatory joint diseases (RAOS) has recently been published . Symptoms experienced from the hip differs to some extent from symptoms experiences from the knee and foot which is reflected by differences in the symptoms subscale of the HOOS compared to the other modifications. Swelling, range of motion, and mechanical symptoms were not included in the HOOS due to low relevance and responsivenss. With regard to physical activities however there were only minor differences between the HOOS and the other modifications. Why is the KOOS a good instrument to consider using? The KOOS is a comprehensive instrument including five subscales assessing aspects of knee injury and knee OA considered important by patients. Most other instruments used for acute knee injury aggregate items measuring different aspects into one score. This procedure flattens the results and makes interpretation more difficult since the included items do not always correlate. The KOOS is self-administered and takes approximately 10 minutes to fill out. It is a feasible instrument as illustrated by few missing items, 0.8% for subjects having knee arthroscopy and 3.2% for subjects having total knee replacement, when administered by mail [6, 8]. Since a subscore can be calculated when two or less items are missing for each subscale, it was only in a few cases a subscore could not be calculated. Patients sustaining knee joint injury are often young and physically active. An advantage when using the KOOS for studies of the long-term consequences of joint injury in such patients is that the KOOS assesses sport and recreation function and knee-related quality of life and has a greater responsiveness compared to other more generic instruments such as the WOMAC and the SF-36 (Fig 2). Effect sizes of KOOS, WOMAC and SF-36 six months after ACL-reconstruction. Comparison of effect sizes of KOOS, WOMAC and SF-36 six months after surgical reconstruction of the ruptured anterior cruciate ligament. Effect size was defined as mean score change divided by the pre-operative standard deviation. The data are previously published (n = 21, mean age 32 years) . Placebo or sham treatment results have not been subtracted to generate effect sizes. It should be noted that the effect size displayed here will be influenced by the preoperative within-group variation of the score dimension measured. What are the applications of the KOOS? The KOOS is intended to be used over short and long time intervals; to assess changes from week to week induced by treatment (medication, surgery, physical therapy) or over the years due to a primary knee injury, posttraumatic OA or primary OA. The KOOS collects data on five knee-specific patient-centered outcomes: (1) pain; (2) other symptoms such as swelling, restricted range of motion and mechanical symptoms; (3) disability on the level of daily activities; (4) disability on a level physically more demanding than activities of daily living; (5) mental and social aspects such as awareness and lifestyle changes. The KOOS is self-administered and filled out by the patient. In the Swedish validation studies the questionnaires have been sent and returned by mail. In the American validation study the questionnaires were either filled out prior to a doctors visit or by mail. No interview or phone formats are available. How long does it take to complete the KOOS? The KOOS takes about 10 minutes to fill out. How is the KOOS administered? The KOOS is self-explanatory and can be administered in the waiting room or used as a mailed survey. How is the KOOS scored? The five patient-relevant subscales of KOOS are scored separately: Pain (nine items); Symptoms (seven items); ADL Function (17 items); Sport and Recreation Function (five items); Quality of Life (four items). A Likert scale is used and all items have five possible answer options scored from 0 (No Problems) to 4 (Extreme Problems) and each of the five scores is calculated as the sum of the items included. Scores are transformed to a 0–100 scale, with zero representing extreme knee problems and 100 representing no knee problems as common in orthopaedic assessment scales and generic measures. Scores between 0 and 100 represent the percentage of total possible score achieved. An aggregate score is not calculated since it is regarded desirable to analyze and interpret the five dimensions separately. Is there automated administration or scoring software? How are the KOOS scores interpreted? Is the KOOS responsive to change? The effect sizes following surgical procedures vary both with regard to the procedure being undertaken and the specific KOOS subscale. Generally, the subscale QOL is the most responsive, followed by the subscale Pain. The highest effect sizes observed were obtained after total knee replacement (Figure 3). Effect size for different surgical interventions measured by KOOS. KOOS effect sizes 6 months following surgical knee interventions. Effect size was defined as mean score change divided by the pre-operative standard deviation. The data from total knee replacement  (n = 105, mean age 71.3 years) and anterior cruciate ligament reconstruction  (n = 21, mean age 32 years) are previously published. The data from tibial osteotomy concerns 50 patients (mean age 54 years) undergoing hemicallotasis osteotomy (W-Dahl A, Lund University, personal communication 2001). The data from cartilage repair concerns 50 patients (mean age 34 years) undergoing autologus cartilage transplant (Olsson M, University of Gothenburg, personal communication 2002). 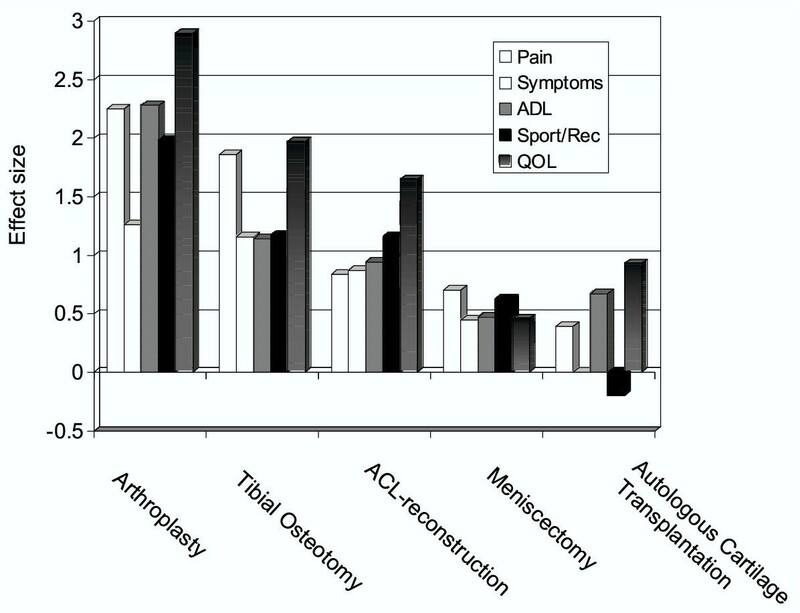 The data for meniscectomy concern 66 patients (mean age 44 years) undergoing arthroscopic partial meniscectomy (Roos E, Lund University, personal communication 2003). Placebo or sham treatment results have not been subtracted to generate effect sizes. It should be noted that the effect size displayed here will be influenced by the preoperative within-group variation of the score dimension measured. This may vary between the different study groups. All data are published with permission from the authors. Several randomized trials using the KOOS have been published. In a trial comparing two methods of reconstruction of the ACL, significant differences between groups were found in ADL, Sport/Rec and QOL at various postoperative time points . In a trial of glucosamine supplementation, significant group differences were found in Pain and ADL . In a trial of a nutritional supplement significant between-group differences were found for ADL . In all trials, significant improvement was detected in the treatment groups over time. The number of subjects in each treatment arm in these RCT:s ranged from 15 to 27. In a study on continuous passive motion as supplemental treatment following total knee replacement, no significant differences were found between groups . What is the meaningful change for the instrument? The minimal perceptible clinical improvement (MPCI) represents the difference on the measurement scale associated with the smallest change in the health status detectable by the patient. The MPCI of the KOOS has not been formally assessed. Since the KOOS questionnaire contains the full and original version of the WOMAC index and WOMAC scores can easily be calculated, the MPCI of approximately 10 obtained for the WOMAC  has been applied to KOOS in power analyses and when determining cut-offs for improvement and deterioration (Paradowski P et al., personal communication 2003). Accordingly, a level of 10 points or more of improvement or decline was suggested as a cut-off representing a clinically significant difference. In support of this suggestion, we compared KOOS data after ACL reconstruction with the clinical knowledge of rehabilitation phases following ACL reconstruction. Three months postoperatively, the patients experienced some pain, swelling and restriction in range of motion and had not pushed their knee during sporting activities. This was reflected by (statistically non-significant) changes of 1 to 7 KOOS score points in pain, symptoms, and sport and recreation function over this time interval, compared to preoperative scores. Six months postoperatively, the patients were back at more vigorous activities including sport and had few symptoms, reflected by (statistically significant) changes of 8–23 score points in all subscale scores. Thus, it seems that a change in score of 8 points or more may represent a clinically significant change following ACL reconstruction. We thus suggest that 8–10 points may represent the minimal perceptible clinical improvement (MPCI) of the KOOS. However, to further explore this difficult question, additional studies including different treatments and patient groups should be undertaken. Has the KOOS been used in individual patients? The test-retest reliability has been sufficient for most subscales in most studies to allow assessment of change over time in individual patients. The KOOS is frequently used in the clinic to help patients and therapists follow the progress after interventions due to knee problems. In which populations has the KOOS been used? The KOOS is intended to be used in knee injury that can result in post traumatic OA or in primary OA. The KOOS has been used in men and women ranging from 14–79 years in age with varying disorders resulting in knee complaints such as anterior cruciate ligament tear, meniscus tear, and mild, moderate and severe OA. The KOOS has been used to follow the immediate post-operative period and in 10 to 20 year follow-ups of knee injury. The KOOS was published in 1998, and in prospective studies of knee injury no longer follow-ups than 2 years have been published to date. The KOOS has also been used in healthy female soccer players . By others, the KOOS has been used to assess the effects of anterior cruciate ligament reconstruction , glucosamine supplementation , and nutritional supplementation . Do we need permission to use it? Permission is not required to use the KOOS. Who may I contact to obtain a copy of the KOOS? How can we obtain more information about the KOOS? How much does it cost to purchase the KOOS itself? The KOOS is free of charge. How can we obtain a scientific support during our study? The KOOS was first published in 1998, and is thus a relatively new instrument. Its use in several different patient groups is supported by the currently available literature. However, further use of the instrument will add knowledge and suggest areas that need to be further explored and improved. The KOOS was developed as an extension of the WOMAC Osteoarthritis Index with the overall purpose to evaluate short- and long-term symptoms and function after knee injury and OA. The reason for developing one instrument covering several types of knee injury and OA was that these structural damages often coincide within patients. All the questions of the WOMAC LK 3.0 were retained so that a WOMAC score might be calculated separately and compared with the KOOS score. This would also facilitate comparison of outcomes with previous studies using WOMAC on other patient populations. Knee injury most often includes damage to the ligaments, the menisci, or the cartilage. These injuries can be isolated but are frequently combined, and often result in the later development of OA. About 10–15 years after an injury to the menisci or anterior cruciate ligament, approximately every other patient has developed radiographic OA [20–23]. To increase sensitivity for patients with knee injury, items were added to the WOMAC pain and stiffness sections and two new subscales were added, resulting in a 42 item questionnaire with five subscales; Pain (9 items), Other symptoms (7 items), ADL Function (17 items), Sport and Recreation Function (5 items), and knee-related Quality of Life (4 items). As expected, larger effect sizes of the KOOS compared to the WOMAC was found in younger subjects (age 18–46) with knee injury . Increased sensitivity of the KOOS compared with the WOMAC was also shown in previously meniscectomized subjects with and without radiographic knee OA aged 38–76 . However, a more unexpected finding was that larger effect sizes were found for the KOOS compared to the WOMAC in elderly subjects (age 43–86) treated with a total knee replacement because of severe knee OA . Increased sensitivity may yield larger score changes over time, resulting in larger effect sizes. This in turn may allow smaller patient study groups when comparing treatments. KOOS was developed as an extension of the WOMAC Osteoarthritis Index with the purpose of evaluating short- and long-term symptoms and function in young and physically active subjects with knee injury and OA. The questions of the WOMAC LK 3.0 were retained so that a WOMAC score might be calculated separately and compared with the KOOS score. As expected, larger effect sizes for KOOS as compared with WOMAC were shown for young subjects with knee injury. The use of KOOS with different patient groups is supported by the available literature. However, further use of the instrument will suggest areas that need to be further improved. ER drafted the manuscript. SL contributed significantly to the manuscript. Both authors read and approved the final manuscript.